April Fools and Somebody Help Me 1 & 2: three more films to add to the “urban horror” genre, and they’re all slashers! It’s a holiday horror flick, but don’t expect it to have a prank reveal like April Fool’s Day. This is a by the book formulaic I Know What You Did Last Summer slasher. A group of friends plays a mean trick on a geek on April Fool’s Day, accidentally killing him then covering it up. You know the drill. Which also means you know that a masked killer starts offing them exactly a year a later. The film is short and to the point (an hour and ten minutes), offers a whodunit plot, and definitely captures the spirit of classic slashers. Plus, the cast is quite good—especially the final girl—and the guys are hot! Sadly, I couldn’t find stills from the film online to prove it! 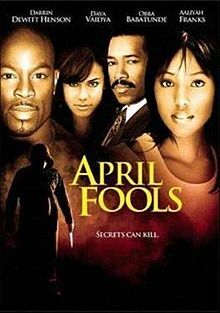 The highlight of the film is most definitely the April Fools dance, which comes complete with an entire hip hop performance and a chase scene that is reminiscent of Wendy’s chase scene from Prom Night. But it’s what happens on the dance floor that punctuates this sequence with a serious exclamation point. The weakness of the film is in all its other kill sequences. They are pretty much all done in slow motion, which manages to reveal the shortcomings of faux fighting. Plus, during these segments, the sound editing does nothing to enhance the feeling of the kills. Essentially, the audio drops out, some musical score plays in the background, and no cringe worthy sound effects whatsoever are employed. I can guarantee that if this film was re-cut with quick edits during the kills and intense sound effects, it would get a lot more love than it does. Also, the flashbacks need to go. Every time someone is killed, we see a reminder flashback to that character’s involvement in the opening scene. Come on. Even my attention span isn’t that bad! Somebody Help Me is possibly the best urban horror slasher film I’ve seen. But it does beg the question—if the cast of characters heads to a cabin in the woods, is the movie really an urban horror? I’ll never understand the concept of calling horror “urban” just because the cast is predominantly black. There are black people who don’t live in urban areas and white people who do, but…whatever. I’ll admit that the killer’s backstory in Somebody Help Me (outlined in newspaper clippings, naturally) pans out poorly, is pretty much irrelevant to the movie or the characters in it, and fails to explain the killer’s motivation. Plus, there are what appear to be some supernatural or psychic elements that aren’t necessary and just bring confusion to the plot. However, as a mindless slasher, the film works perfectly, borrowing many of the best conventions of the genre: a bunch of kids at a cabin; a creepy peeping Tom neighbor; a sheriff (a Scare Tactics regular) who may or may not be a good guy; and a big ominous killer in a creepy mask roaming around and delivering plenty of jump scares and chilling moments. On top of that, there are gnarly torture scenes and some great chases and killer confrontations. There are even some good jabs at white people making dumb mistakes in horror movies…the kind black people end up making in this movie (like dropping the knife!). 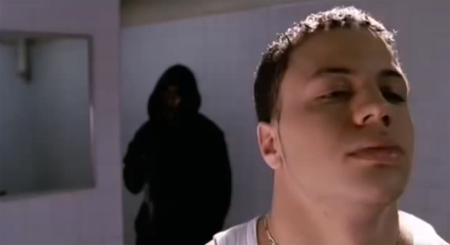 And finally, there are likeable characters, including adorable leading man Marques Houston…. and his beautiful girlfriend, played by Brooklyn Sudano, who happens to be the daughter of Donna Summer! Unfortunately, the killer escapes at the end of the first film. I say unfortunately because the sequel is absolutely awful. It feels like an uninspired cash-in. The survivors of the first film are still coping with the tragedy as the anniversary approaches. Marques Houston is back and has dumped Donna Summer’s daughter for a new chick, to whom he’s married. He, his wife, his niece, and his best buddy are kidnapped by the killer and brought to an underground lair that’s like something out of Saw. But don’t expect any of the torture from Saw…or even from the first Somebody Help Me. The sequel is nothing more than a movie about the four of them escaping. It’s just a lot of running around in underground tunnels. Yawn. The film is left open for a sequel but not sure that will ever happen. Chris Stokes, director of the franchise, who also directed the horror flick No Vacancy is quite the beefcake. This entry was posted in Movie Times & Television Schedules - Staying Entertained, The Evil of the Thriller - Everything Horror and tagged April Fools, slashers, Somebody Help Me, urban horror. Bookmark the permalink.